Topics: Buying, Buying Tips, and Selling. 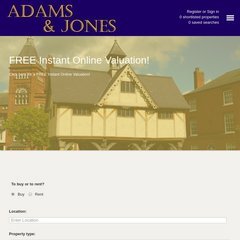 adams-jones.co.uk Rent in Leicestershire, Let in Leicestershire, Rent house ..
adams-jones.co.uk Leicestershire property, Buy house in Leicestershire , Property ..
adams-jones.co.uk Whitehot properties, must sell properties in Leicestershire ..
Its 2 nameservers are cow.hbsinternet.co.uk, and chicken.hbsinternet.co.uk. Its web server is located at Movewithus London Hosting (England, Cambridgeshire.) The programming language environment is ASP.NET. PING www. (81.91.110.225) 56(84) bytes of data.